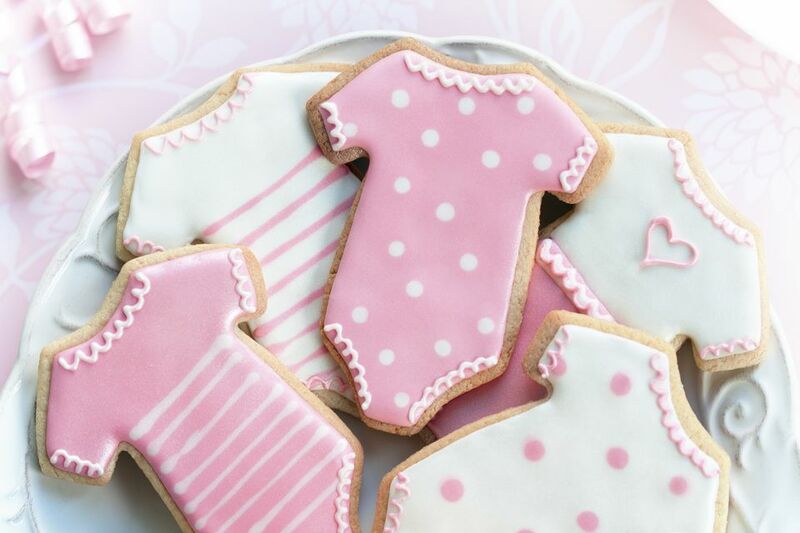 One of the easiest patterns to create with fondant is a simple polka dot effect. This look is created by using a contrasting color of fondant or gum paste that is cut out into shapes and then rolled into a different background color. You can use the exact same size and color of dots or an assortment of sizes to create unique designs. Pick the colors you need and decide if you want to use fondant or gum paste for the design. Fondant can be best for cookies or cupcakes where you are covering the whole top. Use a toothpick or the tip of a knife to add color to your fondant and knead the color in until the hue is uniform and there are no streaks. 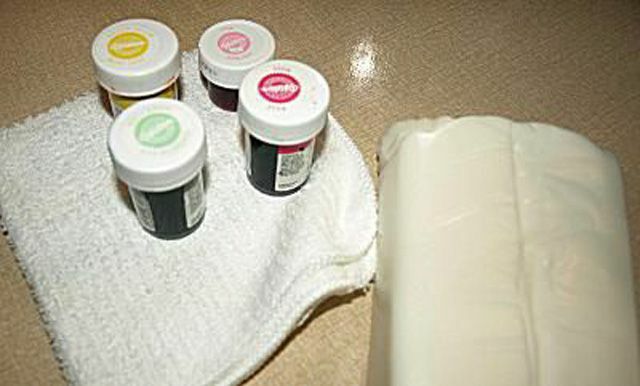 Add more color paste if the shade is not rich enough or add more fondant to lighten the color until it is perfect. Repeat Step Two until you have all the colors needed for the design. Keep in mind the look you want to achieve with the patterned fondant. All pastels for a baby or bridal shower, bright primary colors for a birthday cake or shades of white, gold and silver for an anniversary all are great combinations to create. Pick the first (or only) color for the dots and roll the fondant fairly thin. Thicker fondant or gum paste will be harder to press into the background color and will not create a smooth finish for the project. Use different cutters to create the dots. These can even be small hearts, diamonds or other shapes rather than circles. You can use the end of a piping tip as well if you don't have a circle cutter. Set polka dots aside and cover to make sure they stay moist. Roll out whatever color you need for the background of your design. If you need a large piece of patterned fondant then keep in mind it will be larger after the second rolling. You will also roll the fondant thicker than the polka dots because you are going to roll it again when the pattern is set. Place the cutout dots onto the rolled out background fondant either in straight evenly spaced rows or scattered randomly across the surface. You can also use smaller or larger circles of different colors to create interesting designs. The background color can be a color other than white as well. The circles will spread out as the fondant is rolled out so take care to place the dots close enough together. Carefully roll the patterned fondant out taking care not to disrupt the dots and ruin the pattern. Try to roll from every direction because the pattern will enlarge in the direction you push. If you want your polka dots to look like ovals then roll in a single direction. You can also use a fondant smoother instead of a rolling pin especially if you are working with gum paste. If you are not using the patterned fondant or gum paste right away take care to wrap it in plastic so it stays moist and pliable. After the fondant pattern is done store it until you need it for your design. You can cut the fondant to place on top of cookies or cupcakes or wrap a whole cake in the design. Using two or even three different dotted designs with various background colors and types of dots can look spectacular of tiered cakes. A topsy turvy cake, in particular, can be enhanced with this type of patterned fondant. Don't be afraid to try different looks until you achieve the perfect effect.